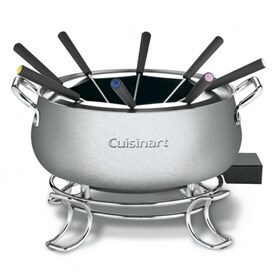 The Cuisinart CFO-3SS electric fondue set is a versatile heating system. The heating element is built into the base of the pot and a thermostat is adjustable to a wide range of temperature settings. This easy to clean nonstick pot is ideal for preparing chocolate, cheese, broth or oil fundues. Its 3-quart brushed stainless pot is dishwasher safe. The 3 Qt Electric Fondue Set has many exciting features for users of all types. You can extend the lifetime of your 3 Qt Electric Fondue Set with the purchase of a FactoryOutletStore Factory Protection Plan. See the 3 Qt Electric Fondue Set gallery images above for more product views. The 3 Qt Electric Fondue Set is sold as a Brand New Unopened Item.